AEBAS AADHAAR Enabled Biometric Attendance System in Telangana Schools. Biometric Attendance System in Telangana Schools- How to Check Hazar Reports of your school for attendance : Implementation of Aadhar Enabled Bio Metric Attendance System (AEBAS) in Government and Local Body Schools during the Academic Year 2018-19 in the state - certain instructions. Biometric Attendance System will be implemented in Telangana Schools from next academic year: We have many survey results saying that our education system is poor and children are unable to have minimum levels of learning. Biometric Attendance System in Telangana Schools, Telangana Students Biometric Attendance System, Telangana Teachers Attendance, Telangana Schools Web Portal, Telangana School Functioning, Monitoring, MDM System, Aadhar Feeding, Child Info, Recently we also discussed the reasons/factors that effect the education of a student. In those reasons one of the reason is teacher’s irregularity/irresponsibility not all but some of the teachers are resembling above words. 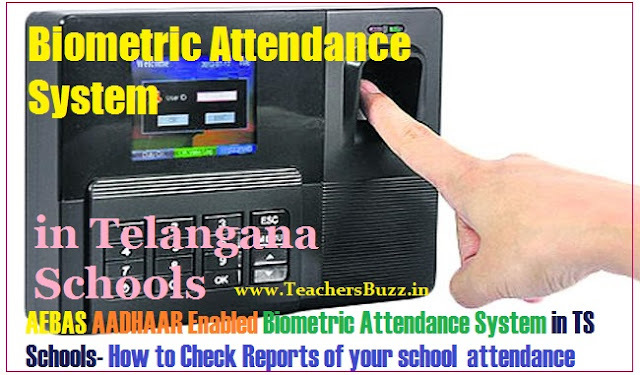 TSTS- ABAS website link, Biometric Attendance System in Telangana Schools- User manual in telugu and How to Check Reports of your school attendance - How to track Biometric to attendance of teachers students details here. As a part of rectifying mistakes and improve the quality of education govt planning to introduce the biometric system in schools. By this system teachers attendance, pupil attendance will be same as in the register no take names of pupil will be entered in register. By this system we can avoid the misfunctioning of mid-day meal scheme. The Telangana state education department has directed schools to implement online attendance monitoring systems in around 10,000 government schools in 12 districts using Aadhaar biometrics. Hyderabad: Leave alone schools seeding Aadhaar details of students with the central database through U-DISE, the Telangana state education department has directed schools to implement online attendance monitoring systems in around 10,000 government schools in 12 districts using Aadhaar biometrics. The attendance system would be Aadhaar-based with devices endorsed by the Unique Identification Authority of India (UIDAI). Officials from the education department said about 12,500 devices were being installed in schools to get information on student attendance by capturing iris and biometrics data. A senior officer with the education department said, “The system has been tested in 10 schools. It will work 26 days a month and 12 hours a day.” He dismissed apprehensions that the security of Aadhaar data would be compromised, stating that only the biometrics were being recorded for identification. 3. Next enter Password: School@123! 5. Welcome To TSTS ABAS screen will be opened. First this system will be introduced in some schools and by achieving results it will be implemented in all schools. In this system all schools including pvt will be computerized and web portal will be arranged in the office of school education Director through online he/she will supervise/inspect the teacher’s attendance, pupil attendance, facilities provided to students. A new website is going to design where the information of schools, students, teachers will be available the distance and details of schools will be available in the form of pictures. Already the details of students are connected by aadhar no the recognized schools should enter the details of students in this website and facilities provided this system may be implement from next academic year. In a move that could bring out change in the attendance of both students and teachers, the State government has decided to install biometric systems in 7,000 government schools across the State. The biometric systems will be installed in all Model schools, Kasturba Gandhi Balika Vidyalayas and select government schools in the State. The Directorate of School Education has set the deadline as January 31 for the installation of the systems. The process of installing the systems, despite a budget of Rs 4.4 crore being released to District Collectors in July last year, was held up due to the reorganisation of districts. “We have now issued orders to install biometric systems in about 7,000 schools by January 31,” said G Kishan, Director of School Education. In the first phase, the Directorate intends to install biometric systems in 25 per cent of the schools across the State. Though it is believed that this move would checkmate irregularities in attendance of students and teachers in government schools. The government had to first focus on implementation of provisions of the Right to Education Act before installing biometric systems or CCTV cameras in schools.